The BBC news website published a shocking article yesterday entitled "Rubble and ruins by Olympic Park". They sent a reporter to circumnavigate the park with a camera, photographing the neighbourhoods that immediately encircle it. And they discovered many an "unlovely spot" amongst the "scenes of urban decay". How ghastly it might be for spectators arriving from abroad to see London like this. I mean, some of us actually have to live round here. It must be awful for us. 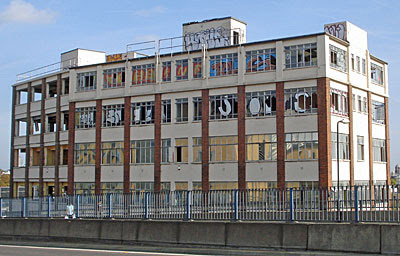 Their prime photographic target was a collection of tumbledown buildings immediately alongside the A12 in Bromley-by-Bow. "Old mattresses. Piles of rubble. A pulled apart children's safety seat. Derelict buildings minus windows, roofing and floors. A car, lacking its entire front section. You might be forgiven for thinking these scenes belong to one of the UK's most unloved and forgotten corners. But no: these photographs were taken less than one mile from the Olympic Park with just weeks until the Games." The site they focused on is indeed a right mess. A former office block stands empty, its windows smashed, its internal structure open to the elements. The main staircase lies fully exposed to southbound traffic, the exterior topped off by colourful graffiti. Office equipment - anything not worth nicking - has been scattered across the floors inside. Someone has been sleeping in a downstairs office on a seriously manky mattress. And yes, the surrounding former workyard looks even worse. Which is odd, because if all had gone to plan this should have been a super-size Tesco by now. Three years ago the supermarket giant announced they'd be transforming a patch of land between the road and the river into Britain's first Tesco Town - a mixed retail/residential cluster with its own library, primary school and hotel. First to go up would be a bigger-than-we-have-now supermarket and then they'd knock the old one down and build megaflats on it. Stage 1 was due to happen by March 2012, but hasn't. There's not even been an attempt at demolition... hence the existence of several crumbling abandoned buildings and assorted detritus all around. 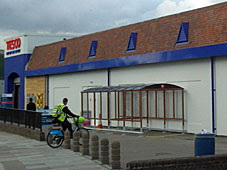 Indeed, earlier this month Tesco pumped money into their existing supermarket, recladding the exterior and removing the tower above the entrance, which suggests there are no plans to progress their Tesco Town vision for the foreseeable future. What the BBC's journalist found by the A12 wasn't a lack of major planned redevelopment, but a failure of funding. They were also unimpressed by "an abandoned pub, swathed in graffiti and boarded up" in Hackney Wick - that's the Lord Napier by the station, which almost no Olympic spectators will walk past. They were dismissive of the Lea - "an entire stretch of river was clogged with sewage and weed, releasing a sulphurous stench" - although Thames Water said this was unusual and heavy-rain-related. And they were also underwhelmed by a derelict garage on Stratford High Street - very close to the Greenway Gate - although that had already been demolished by the time the BBC got round to publishing their story. So, nothing too dreadful then. Nothing that'll make Games spectators turn round and run screaming with fear from the Stratford/Bow area. Indeed I'd argue that many of the blocks of flats erected around here in the run up to the Games are so architecturally vacuous that they're far more offensive than the crumbling post-industrial remnants the BBC's been complaining about. As more and more of my local neighbourhood turns into residential Anywheresville, wholescale gentrification is sucking much of this area's character clean away. While it's hard to describe many of the buildings around here previously as "lovely", it's equally impossible to describe what's replacing them as "interesting". To round off their article the BBC contacted Graham Hales, chief executive officer of Interbrand London. "These images are disappointing," he said. "By and large the city has had a good scrub up for the Olympics - and these don't show London in the best light." Given the scale of the challenge, he said it was important to be realistic about what could be achieved through the Games. And he hoped everything else London had to offer "would mean its brand was undamaged by the scars of neglect that still litter the East End." Sheesh. It's not that bad in E3 and E15, Graham. Some of us even choose to live here. But if his idea of branded London means living in highrise stacks along shoebox boulevards, give me the occasional characterful derelict building any day. 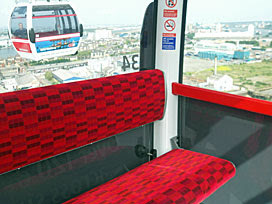 London's new cable car launched yesterday. Boris and the media got to play on it in the morning, and then at noon the gates were opened to the public to take a ride. Queues had built up on both sides of the river, as you'd expect when there's a whopping great piece of fresh transport infrastructure to play with. The problem with such queues is that you get to share your cabin with randomly selected "other members of the public", and the overhead glide isn't then quite so personal. But later in the afternoon visitor numbers had thinned out enough to allow sparser boarding, even an entire cabin to yourself, without the need to fork out £86 for the privilege. Day 1 was certainly popular, but perhaps not as popular as I'd have expected. Lesson 1: try to come at an un-busy time. The terminal buildings look a bit like a giant hairdrier, U-shaped with a glass-walled upper storey. At the head of the curve is the ticket office, where you can queue at the window to buy your thematically-named "boarding pass". There are also ticket machines, some of which are already prone to breaking down. If anything yesterday the queues for the machines were longer than the queues at the ticket windows, which just shows how willing 21st century consumers are to put real humans out of a job. But you can ignore all of that if you have Oyster Pay-As-You-Go, and wander straight in up the left-hand side. Lesson 2: best top up your Oyster card before you arrive. As you pass through, you might like to read the delusional promotional texts that airline PR folk have stickered to the walls. A giant Dizzee Rascal urges riders to look towards Poplar to see his old school (not a hope of that). We're told that "William Turner" was inspired to start painting in Brentford (which is thirteen miles away, and they've got the wrong painter - try JMW). Charlie Chaplin was apparently born "just down the river from this very spot" (no, upriver, in faraway Lambeth), while Alfred Hitchcock was born "just down the road in Leytonstone". And so it goes on, with references to Big Ben and Frost Fairs and mini skirts (the latter supposedly big in Chelsea). This Thames-obsessed parade of irrelevance is clearly aimed at engaging people who don't know London well, and appears to have been written by one of them too. Lesson 3: this is definitely an attraction aimed at tourists, not commuters. At the far end of the ground floor, through the ticket gates, is a space where you're free to stop and watch the gondolas taking off and landing. Do stop and gawp, especially if any unwelcome passengers are passing (eg a family with small loud children), because you might then avoid standing next to them in the queue upstairs. There's a lift if you need one, which is also the way that cyclists get their bikes through. This is the only cycle-friendly route across the river between Tower Bridge and the Woolwich Ferry, so it's sure to be welcomed. Lesson 4: try not to queue next to anyone you wouldn't want to share a cabin with. You rise up into the boarding area, at the heart of the machine, where a giant wheel powers the cabins in, round and out. It reminded me of queueing for a theme park ride, which I guess is highly appropriate. Watch out for the control panel with its emergency stop buttons, and the sequence of grinning Londoners waving slightly too excitedly from the video wall. If you're on the North Greenwich side, also look straight ahead to see the tracks to the shed where they store the gondolas overnight. All the boarding staff are dressed smartly in black like stewards or stewardesses, even though they really work for a construction company. They'll likely try to get you to share a cabin, but it may not take much to persuade them otherwise if the queue's light. Lesson 5: ask to take the next empty cabin, you might succeed. And you're off. As the cabin swings round, and the doors close, suddenly there is no escape. If it turns out you have no head for heights, there's nothing you can do now except endure the flight to the other side, all 1103 metres of it. You take off fairly sharply, rising swiftly into the sky, much faster than is ever the case on the London Eye. The usual speed is six metres a second, but they plan to slow things down to half that between 10am and 3pm to provide a longer tourist experience. Before long a disembodied voice kicks in, welcoming you aboard on your ascent to "a cruising height 295 feet". The airline-themed branding could be a lot worse, to be honest, and the interior of the carriage is a lot less Emirates-y than the stickered outside. Lesson 6: unless you're in a hurry, you'll get best value between 10am and 3pm. It is a little bit humpety-bumpety as you roll over the top of the tower, but nothing too bad. If it's windy, you'll definitely notice. If it's hot and humid, a couple of high-up opening windows provide some ventilation. If it's wet, expect the glass to be too blotchy to take any decent photos through. But what most seems to unnerve the unwary on the way across are the unscheduled stops when a wheelchair user needs to board at either end. The cable grinds almost to a halt, everyone's left dangling in midair and the disembodied voice leaps in with a few words of reassurance. Each stop adds about a minute to your ride, an extra 20% of airtime, which if you're trying to get your money's worth is actually really good. Lesson 7: it's not that scary, but if you get vertigo, think twice. And what of the view? The two main highlights are the Thames and the Dome, and then perhaps Canary Wharf in the middle distance. The cablecar rises much higher than the Dome, almost as high as its crown of yellow spikes, and so provides a much better view than the "climb to the top of the O2 for £22" attraction that opened there this week. Closer by, the landscape isn't especially lovely. On the North Greenwich side it's mostly car parks, plus space where one day flats might be built. On the Royal Docks side, the entire waterfront area is given over to scrap yards, rubbish dumps, warehouse facilities and factories, which almost certainly isn't what tourists were expecting, but might have a certain post-industrial charm. Lesson 8: best come on a sunny day, because it'll look drab when it's grey. Look further afield and you'll soon see how incredibly flat East London is. Shooters Hill is the only outpost with significant contours, otherwise the landscape's level to the horizon across umpteen square miles of ever-decreasing housing estates. Downriver the Thames Barrier should be clearly seen, the M25's QE2 bridge considerably less so. The Olympic Stadium's very visible if you look carefully, if a bit small, also the Orbit alongside. 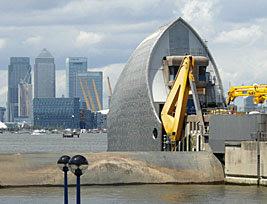 The City's skyscrapers are outgunned by those in Docklands, and the Shard spends most of its time hidden behind the Canary Wharf cluster. If you've picked up the in-flight map before you boarded, that should help you to identify a few more famous-ish sights in amongst the indistinguishable urban sprawl. Lesson 9: you may need to ask for the map, try at the ticket office. And before long you're descending again to the second terminal on the other side of the river. The last few seconds are slightly turbulent, like a plane coming into land, but nothing in any way disconcerting. Expect a mild disconnect as you step out of the moving cabin onto the platform, and then it's back down the stairs to ground level. There are further gates to pass through - this is where Oyster swipes your money - and then you walk out onto the piazza and decide what to do next. Many people yesterday were milling around for a while before deciding to go back again, which does instantly double the price of your day out, and the view is obviously identical. It could be a nice little money earner for TfL, but only if riders continue to turn up, and that's yet to be proven. I suspect the cablecar is something some many Londoners will do once and enjoy, probably sooner rather than later, but most will never come anywhere near. Lesson 10: long term, the future's reliant on getting tourists out here. "Hello Sir, and welcome to London's newest airport. Have you flown with us before?" "We don't actually fly to Dubai from here, you understand, nor to any other part of the Middle East. But we do have regular services to North London and back again. We're expecting the service to be very popular." "Would you like to check in your luggage Sir? That's a shame because we don't allow large suitcases on board. The cabin's only small and there's no stowage space. We've modelled ourselves on Ryanair, so passengers with only hand-luggage are given vastly preferential treatment. Or bicycles. We'd take your bicycle, Sir, if only you had one." "First or second class, Sir? Most of our passengers fly economy, but that might mean sharing your row of seats with a screaming baby, several bouncy children or a bloke eating a kebab. Trapped with them in midair for the entire journey and no possible means of escape, imagine that. Or I could offer you an exclusive first class flight for just £86 return, with no other passengers in the cabin, guaranteed. Can I tempt you Sir?" "Please have your boarding pass ready, Sir. If you have a contactless card you can go straight through, otherwise you'll have to queue here for manual processing. No really, Sir, it's very good value for money. Our stand-by fare is only £6 a mile, whereas our flights to Dubai normally cost 15p a mile." "We don't offer reserved seating, Sir. It's a free for all, first come first served. But do try to get a window seat if you can. There are some excellent views of the North Greenwich Arena overspill car park and the Royal Docks riverside industrial wasteland." "Before you board your flight I need to ask you to pass through those gates over there. No, they're not security, Sir. We allow passengers aboard our flights without any kind of scan or friskdown, it's company policy. We've done our risk assessment, and the worst that could happen is an explosion bringing the entire structure crashing down into the Thames. But we don't think that's likely, Sir." "Chicken or pasta? We do neither, Sir, it's only a five minute flight. But we do have a duty-free trolley service in the terminal building offering drinks, snacks and light refreshments." "There may be some turbulence during your flight, Sir. It's a steep ascent from the terminal, and then you can expect several bumps as the cabin levels out. No we don't have seat belts, we don't believe they're necessary. If there's any trouble just buzz the stewardess. She's on the ground in the control tower rather than on board, but don't worry, her beady eye is keeping watch over you." "There isn't time for an in-flight movie, Sir, but we will be showing you some adverts. Adverts for ourselves, obviously, to encourage you to take a proper long haul flight later. You probably saw rather a lot of adverts all over the walls at the tube station on the way here, and on our sponsored London route map. We'd hate international tourists not to know we exist." "Don't worry about the landing, Sir, that's taken care of by auto-pilot. You may have to wait a while at the carousel, but it's a domestic flight so there's no Customs to walk through. I should warn you there's bugger all at your destination, apart from a Londis and a Tesco Express, and an exhibition centre with no exhibitions for the next month. But our staff will be only too happy to sell you another flight back. Can I interest you in a frequent flyer pass, Sir? ...Sir?" After promising the world an Arcadian idyll, Danny Boyle's vision of dystopian London proved a huge letdown last night. Viewers worldwide watched open-mouthed as a man dressed as Queen Victoria performed skateboard tricks during the lengthy scenery reshuffles. It was left to Mayor Boris Johnson to raise the tone later in the evening by cycling around the arena on a pushbike. "I was at least expecting Henry VIII and Sherlock Holmes" said Jean Sharples, a tourist information officer from Totnes. "Instead we got NHS nurses pushing trolleys and a bunch of kids singing rap poetry. It made me ashamed to be British..."
A large part of East London was cordoned off this afternoon following a bomb scare in a sideroad near the Olympic Park. Police sealed off Gibbins Road in Stratford and sent in a squad of sniffer dogs to inspect a suspicious package. Spectators had to be evacuated from the Aquatic Centre while the investigation continued, and a medal ceremony was disrupted. The cause of the chaos was eventually traced down to a binbag left on the pavement by pensioner Arfur Zvitninski. "I thought it was Wednesday," he said, "but apparently this week Wednesday was on Tuesday..."
"We were so looking forward to going to the diving," mother of three Sharon Bentwaters told journalists today. "We missed out in the ballot, but my husband managed to get some £450 tickets off someone at work. The girls were so excited. We thought it would only take an hour to get there, but we don't know East London very well, and there weren't any taxis. The trains were absolutely packed, and we ended up having to walk the last bit. Then when we got to security there were long queues, and by the time we'd hiked all the way across the park they wouldn't let us in. Tom Daley had to dive in without us. The girls were so disappointed..."
Police have arrested a group of unemployed males from Ponders End after they were spotted on television in the crowd at the Velodrome. "I couldn't believe it when I saw them," said neighbour Ivy Trudge. "They should be looking for work, or down at the benefit office signing on. But there they were watching the cycling, squandering my hard-earned pension, bold as brass. So I rang 999 straight away. I don't see why we should pay for these people to have a good time, it's a matter of fairness..."
As the Olympic fortnight draws to a close, officials will look back with great pride at a successful, well-organised Games. It rained a bit. A train broke down. Someone fluffed their lines in the Opening Ceremony. There were a few empty seats at the volleyball. We're only ninth in the medal table. But overall it's been a triumph, a time of celebration, showcasing everything that Britain does best to the wider world. "It's been far more than we could have hoped for," said Seb Coe, "and I'd like to pay tribute to everyone who made it happen..."
The Green Chain is a collection of footpath filaments that spread out across southeast London from Erith to Crystal Palace. 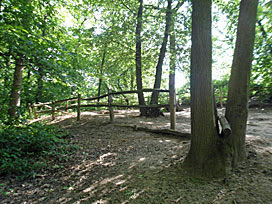 This Geotrail links several segments together, connecting a dozen points of geological interest through Charlton, Plumstead and Abbey Wood. All you need is the leaflet - short version here, more academic version here. It's an unexpectedly fascinating stroll, especially if you've not been this way before. The Thames Barrier's not there by accident, you know. All those heavy gates need support, which is provided by a narrow ridge of chalk cutting beneath the river [photo]. To find out more you could explore the exhibition at the Visitor Centre, although it's so brilliantly disguised as a cafe you'd probably never guess the basement attraction was there. Just inside the main door you can also pick up the free Geotrail leaflet - they appear to have dozens left, because I guess it's hard to persuade visitors just arrived by car that walking to Thamesmead is a good idea. Rest assured, it is a good idea. On heading inland you'll reach Maryon Park where at a signpost the path divides. Absolutely definitely turn right, unless you're on wheels, to climb steadily to the top of Cox's Mount. The view from the summit is undoubtedly best in leaf-free midwinter, but all year round the panorama includes Docklands, Dome and Dangleway, plus London's great river meandering through [photo]. This is the final hill on the downstream Thames, with a former quarry beyond in which the strata of geological time are revealed. An information board at Gilbert's Pit explains all, in refreshingly non-dumbed-down language - rarely in London are layers of sand and clay exposed as clearly as this. The yomp across the top of Woolwich isn't lovely - someone let a bunch of 70s architects loose south of Nightingale Place and the end result isn't pretty. But soon comes Plumstead Common, and a linear mile or two of green, just too far back for a decent view down across the Thames. I missed the Dog Rocks, two chunks of canine-shaped pebbledash supposedly hidden in a shrubbery by the adventure playground. But I easily spotted Plumstead's former windmill, long since sail-less, now a pub [photo]. And I was amazed by The Slade, which is a wholly unexpected gorge created long ago by torrents of water. Landslips helped create a deep notch - a ravine in suburbia - its slopes now covered with thick woodland. At the bottom, umpteen steps down, is a dark pool watched over by three scowling teenage harpies. If you're lucky they won't be here when you visit, but I didn't hang around. Winn's Common is more extensive, more open, with the occasional glimpse of Barking across the chimneytops [photo]. Close by are the brickfields that helped to create housing over this corner of London, made easier by a fortunate coincidence of clay, sand and pebbles. You can see these Blackheath Pebbles underfoot in Bostall Woods, on the next hill along, across a lost river valley. The woods are in complete contrast to the urban nature of the walk thus far, completely secluded, remarkably peaceful, with barely another walker in sight. The Bostall Heath bowling green provided a brief outpost of civilisation, its members resplendent in Daz-perfect whites. Then it was back into the trees, past hidden ponds, to almost the end of the walk. The Geotrail diverts off the Green Chain right near the end, to climb a long steep slope within Lesnes Abbey Woods. The given reason is to see Chalky Dell - a romantic name for what turned out to be a small deep quarry dug deep into the sand by monks. It's overgrown and missable. But on the final path, in an enclosure just off to the left, is the must-see Fossil Bed. It was discovered by a geologist walking his dog in the 1870s, who found shells and sharks teeth and later the bones of an unexpectedly high number of small mammals. It's one of the richest 55-million-year old sites in the world, and Bexley Council forbids excessive digging without a permit. But poking around on the surface is OK, so long as no more than 2kg of soil is removed, and you might (like me) walk away with an unidentified fossilised incisor. The stones beyond the treeline aren't natural, they're all that remains of medieval Lesnes Abbey [photo]. Although more than a mile from the river, this is the first spot where the land rises above the floodplain, and is rather safer from inundation than the Thamesmead estate below. The Green Chain continues along a concrete walkway all the way to the Thames, but the Geotrail halts here. If you fancy a walk that's a bit different, with a little scientific rigour thrown in, this rocks. We've long known that the Next Train Indicators at tube stations are sometimes installed by cretins. Hidden in recesses, blocked by signage, made semi-illegible by security cameras, that sort of thing. But now there's a new type of hopelessness on the Victoria line, as TfL replace existing Next Train Indicators with new ones, and somehow make things worse. They're more modern, that's for sure. The backgrounds are more black, and the text is more brightly orange, which ought to make things easier to read. But only from close up. Because, alas, the new Next Train Indicators are smaller than those they replace, and the letters are significantly narrower, which makes them much harder to read from further away. My camera doesn't do these signs justice. They're not as blurry and diffuse as these photos suggest, at least not from nearby. But walk further down the platform and the bright orange letters quickly merge, depending on how good or bad your eyesight is, until before long you're staring at an indistinct fuzzy mass of orange. My eyesight's fine, but I was having much more trouble than expected, reduced to deducing the next destination by the general shape of the words. "Walthamstow Central" looks very different to "Seven Sisters", and "Brixton" could only be Brixton, so I could generally work out where the next train was heading. But as for the number of minutes, if that was anything above "1" then from partway down the platform I was stumped. It's just as well that trains run so frequently on the Victoria line that needing to know how long to wait isn't usually a problem. We're currently mid-rollout of these new narrower Next Train Indicators on the Victoria line. Vauxhall's got them, one on each platform, with the northbound display half-blocked by an accessibility sign and a camera. Pimlico's got them, though not close enough to the platform entrance, and one isn't yet operational. 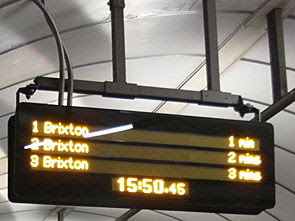 There are two more at Brixton, both currently blank, presumably awaiting their initial switch-on. King's Cross St Pancras has two on each platform, wider than at Vauxhall but less deep, still with their plastic wrappers intact. And Highbury and Islington has a pair too, already up and running, but far enough from the platform entrance that anyone with less than perfect eyesight will struggle to read them. Not being a regular user of the Victoria line it's hard to tell if these new Next Train Indicators have been positioned better than those they replace. Those carrying out the installation might well have tried more carefully than before to avoid aerial sightline blockages - I'd like to think so. But it's an astonishingly retrograde step to introduce displays with narrower text, much harder to read, merging at distance to form an indistinct orange blur. The new Next Train Indicators on the Victoria line - requisitioned by cretins. 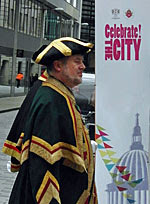 Celebrate the City: When the City of London throws an event, it does it in style. That's because its corporations and livery companies are loaded, so finding funds for a long weekend of celebrations is easy. They also have centuries of history and tradition to fall back on, and the ability to shut down streets, and plenty of volunteers willing to get stuck in and run stuff. Here's a taste of what you might have seen yesterday had you popped down. » Cheapside Street Fayre: It's not every day you see chickens and sheep in EC2, but the Worshipful Company of Poulters and the Worshipful Company of Woolmen brought theirs along. The street developed a proper rural flavour with a fully functioning smithy up and running outside One New Change, courtesy of the Worshipful Company of Blacksmiths, plus all the lathe-turning skills you'd expect from the Worshipful Company of Turners. Wisely, the Worshipful Company of Management Consultants stayed away. » Bow Bells: That's the proper bells at St Mary-le-Bow in Cheapside, which rang a full quarter peal on Saturday - a thunderously fine half hour. Alas, few Cockneys will have noticed. » The Bridge: The Millennium Bridge is normally packed with tourists, so this wasn't an easy performance for the few dozen dancers spread out across it. But they posed, they slunk, they contorted, and they oh-so-professionally ignored everyone staring at them, and they were collectively great. » Plaisterers Hall: The largest Great Hall in the City belongs to the plasterers, who've used all their skills to trowel its surfaces with intricate craftsmanship. It's not what you expect to find in the basement of a 1970s office block... pilasters, architraves, entablatures, and not a splash of Artex in sight. From the back door I finally got to do something I've been longing to do for ages - I walked out of the hall into their back garden onto a platform amid original chunks of London's Roman Wall. And I came away with a free plaster drinks coaster, very recently moulded and set by apprentices in the Livery Hall, which has now just about dried out. 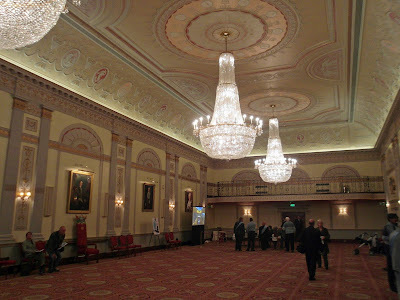 » Goldsmiths Hall: If you want to be a wealthy craftsman, forget plaster, and get into gold. The Worshipful Company of Goldsmiths own lots of the stuff, some decorating their walls and ceilings, and much of the rest currently on show in a major exhibition. They've got cases and cases of the stuff, from Anglo-Saxon torcs to modern jewellery, all laid out on two floors and a staircase for your general perusal. It's a bit showy, but an astonishing accumulation, and remains open for free public viewing until the end of July. The company's arrival in Lefevre Park is, without doubt, the most exciting thing ever to happen here. A hundred or so families are milling around on the grass, waiting, and the area's youths have gathered in tribal clumps. One young man in a grey hoodie eyes me suspiciously, laughs with his mates and then they all turn to look at me. "You with the police?" he asks, with a glinting grin. I protest, but he's having none of it. "Nah, you must be police! White man, single..." (he sneers disapprovingly at my footwear) "...running shoes." And there was me thinking my streetwear might vaguely fit in on the estates of Bow, whereas instead I've got all the labels wrong and look like a copper who's tried too hard. "Don't worry," says the ringleader, "we ain't gonna do you." He smiles a smile as sharp as a blade and adds "We'll see you later." I use the arrival of the leading ant to slink away, trying very hard not to end up standing next to any of the genuine hi-vis coppers on duty here tonight. When the praying mantis arrives, it towers over the two sculpted red flowers in the centre of the park, like some sort of Godzilla come to devour the neighbourhood [photo]. 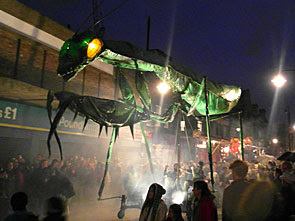 Five minutes of fireworks explode to end the performance, a diversionary measure which allows the various insects to be to de-illuminated while nobody's looking. It's been a lively hour, bringing art to an appreciative community who'd rarely think of going to see art for themselves. I nip off fairly sharpish afterwards, before the drizzle worsens. The Developing City: As part of the London Festival of Architecture, a major exhibition is being held at the Walbrook Building. 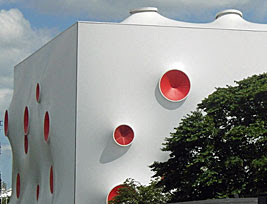 That's the ribbed-blancmange-type building opposite Cannon Street station, if you're not familiar. One day the lower ground floor of the Walbrook will be retail space selling coffee, chocolates and knickers to the traders working in the offices above, but for now it's a perfect empty canvas for mass informational display. There are three sections to the exhibition - essentially past, present and future - with the emphasis very much on individual buildings and their place in the City. The historical section starts with Londinium, the Roman settlement-on-Thames, and works its way up through medieval and Georgian to the aftermath of the wartime Blitz. If you like maps, you're in for a treat. John Rocque's 1746 map of London, Westminster and Southwark is blown up to enormous proportions at the entrance, from the days when Knightsbridge and Camden were still fields (and some of you could probably spend quarter of an hour staring at this alone). The development of London Bridge gets full treatment (one of the proposals for its 19th century redevelopment was a twin bridge with separate drawbridges, blimey), as do several other key City buildings. Best bring your reading glasses if you wear them, there's a heck of a lot of background to digest on these giant boards. On to the present, which takes a more three-dimensional form. A huge 1:500 scale model of the City is on show, created with the kind of intricate detail that's only possible when you're an age-old settlement built on centuries of mercantile wealth. 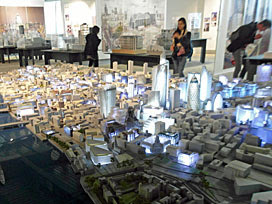 That's followed by individual scale models of some of London's older and newer skyscrapers, and forthcoming office developments, and any other new building the curators could grab the architects model of. I've seen a few of these before, but never quite so many all gathered together in one place, making for a most interesting potter round. And finally the exhibition looks ahead to 2050 and how the City might look then, based on flights of fancy and evidence-based speculation. I doubt that Farringdon will become a Fleet-side river city, or that Shoreditch will become a fluorescent entertainment hub, but I can well believe that Aldgate is ripe for transformation into the City's new financial skyscraper quarter. Lots to think about, lots to see, and lots of time to get here before the exhibition closes. The last day's Sunday 9th September, and it's open every day except Monday, with late opening on Fridays. Ian's been too and has written a full report with plenty of photos, so that's two recommendations for a visit. The stairs down still have rusty irregular treads, but gaining access is suddenly as simple as it once was for gentlemen in need of release. And what a fantastic wedged-shape room this is. The floor's tiled with marble, which you just don't see in modern public conveniences, more's the pity. 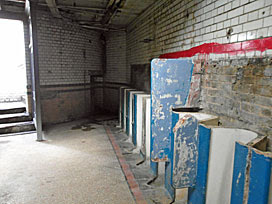 Along the left-hand wall are the urinals, a row of curved porcelain recesses, not so much elegant as chunkily functional. There were no auto-flushing squirters in 1899 when the toilets were built, just open holes draining away to some unseen tank or sewer below. Wherever the washbasins were they're long gone, and the same for the cisterns in the cubicles opposite. The skylight looks like it leaks, the result of years of neglect, but still provides natural illumination even in the depths of a British summer. And just inside the door is what used to be an office, back in the days when public money paid for attendants to keep this place pristine. 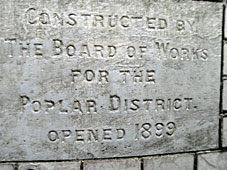 On the way out, past the Poplar Board of Works plaque, you should spot the pots of red paint [photo]. They're laid out on the stairs to the inaccessible exit, each containing a brush, and each glaringly red. You'll have spied red paint elsewhere in the installation, daubed across the tiled wall, even splashed on the overalls of the bloke in the office. And this is the proper symbolic bit. If you look up at the statue of William Gladstone, his arm outstretched, you'll see the red paint daubed across his hand by protesters angry at how this monument was funded. The matchgirls at the Bryant & May factory up the road were forced to contribute from their wages, and had to take half a day's unpaid leave on the afternoon the statue was unveiled. Ladies didn't go on strike in those days, but these girls did, and earned a place in history as a result. Like I said, the Listed Loo experience is open for one weekend only, and that's from two until five in the afternoon today and tomorrow. You might well come to contemplate the art, and that's fun, but I really enjoyed the opportunity to stand in a decaying municipal space I've walked over hundreds of times, but never previously seen inside. They don't make toilets like this any more, that's for sure. Although it's sad to see how even a listed convenience can decay, the loving clean-up undertaken by the artists gives hope that it might somehow be saved from terminal decline. The Bow Arts Trust are taking over responsibility after Listed Theatre leave, so let's hope something long-term good comes out of this short-term event. Something peculiar is happening this weekend. Most weekends some interesting special events take place in London, but this weekend there are more than I can ever remember piled up before. It's as if the organisers all said "When shall we schedule our big event this year? I know, let's pick midsummer weekend!" There's also the Olympics next month, which many will have been keen to avoid, hence the imminent cultural logjam. You're going to have to pick carefully. High Street 2012 Summer Safari (Thu 21 Jun - Sat 23 Jun): The High Street 2012 Heritage, Culture and Community Grants programme is culminating in a 3-day festival of free events on the street. Celebrate the City (Thu 21 Jun - Sun 24 Jun): The City of London Corporation and the Diocese of London invite you to enjoy all the Square Mile has to offer. Ian has a useful list of the highlights here. The Greenwich and Docklands International Festival (Thu 21 - Sun 30): Every year this outdoor multi-evening extravaganza brings dynamic performance art to the East End masses, both north and south of the river. » Prometheus Awakes (10pm): Acrobatic classical spectacle on the lawns outside the National Maritime Museum in Greenwich, as part of GDIF2012. Expect crowds. » Tour of the Bank of England (9:30am - 4pm): Take a free half hour tour round the innards of the Old Lady. Expect shorter queues that for Open House in September. » High Street 2012 Summer Safari (10am - 5pm): Today's the best day to check out all the activities, from Aldgate to Bow, and especially Whitechapel. Expect bells, art, music, a living map, even old people on a mobile sofa. Check the full list of events, and pick carefully. » Exhibition Road Music Day: Music with a cultural tinge, headlined by a French chanteuse, along the pedestrianised street in South Kensington's Exhibition-land. » Tottenham Carnival Parade (sets off 11am): But, alas, not the carnival, which has been cancelled due to lack of funding. » Croxley Revels on the Green (from 1:30pm): A carnival procession, stalls and maypoling, going back to my Metro-land roots. » Greenwich Fair: Another strand of GDIF2012, more than a dozen street theatre-y acts take up residence in Greenwich town centre. » Trent Park Open House (10am - 5pm): Almost your last chance to look inside the old house (nr Cockfosters) and its grounds before Middlesex University sells up. Tours at 10, 12, 2 and 4. I went last month, and I'm very glad I did. » West End Live (11am - 6pm): See free performances from the casts of London's world-famous musicals at this festival in Trafalgar Square. Your mother-in-law would love it. » The Great British Bus Jubilee (9:30am - 7pm): A display of up to 100 old buses from all over the UK, heritage bus rides and a collectors' market, plus an open day in the London Bus Museum (Weybridge). Entrance a tenner. » Diamond Jubilee Gardens (11am - 6pm): Music and a 1930s-style fairground, to celebrate the posh-refurbishment opening of Twickenham's newest public space. Magenta, to be precise, which is the colour popping up on signs all over the London underground network. Magenta signs are the chosen method for directing spectators to Olympic venues all over the capital, and beyond, and over the summer you won't be able to miss them. 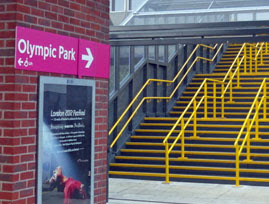 They first appeared back in May in Stratford as part of a weekend of test events, all over the station, pointing their way relentlessly towards the Olympic Park. You couldn't possibly have got lost, not unless you were visually impaired or magenta-phobic. 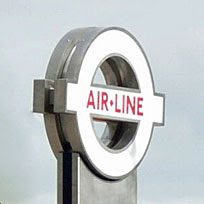 Then they starting appearing on the line maps aboard tube trains, small rectangles indicating which stations were the best places to alight. And now they're appearing all over London, at any station where you might conceivably change trains to get to a Games venue. Pink stickers - some large, others slightly more subtle - attached to almost any wall, surface, map or sign. And five weeks early. Say you're at Whitechapel, for example, hoping to get to the Olympic Park. If you're on the Overground you're in the wrong place, so pink stickers on the platform walls direct you up to the eastbound District and Hammersmith & City lines. Very simple, very effective. Further pink stickers around the station point the way towards Wimbledon, Hyde Park and Horse Guards Parade via the District line westbound, because you might be going there instead. No matter how minor your Olympic event, someone's thought about directing you repeatedly towards the venue. You can see the fine level detail on the enamelled line maps, here at Whitechapel and elsewhere. 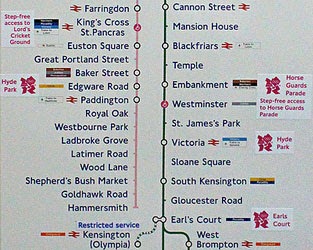 There must somewhere be an endless supply of transparent stickers, and someone's gone round adding pink text next to all the stations close to Olympic venues. On the westbound at Whitechapel that's six different stations, marked by six different stickers, and usually it's possibly to work out which is next to where. Southfields for Wimbledon, Earl's Court for Earl's Court, Victoria for Hyde Park. Or Edgware Road for Hyde Park, the choice is yours - they're both equally far away. Nobody would normally choose to go to Hyde Park via either Victoria or Edgware Road, but TfL would rather you went this way to avoid far busier stations close by. And blimey, there are now pink wheelchair blobs! We've had blue, we've had white, and now for the Olympics we get pink. There's a pink wheelchair blob sticker at Westminster, from which there is "step free access to Horse Guards Parade". The words appear on a sticker so big it's impossible to know which station it refers to, but the pink blob identifies the target. There's another pink blob at King's Cross, which apparently offers "step free access to Lord's Cricket Ground". That may sound daft, given it's a two mile push across Regent's Park, but during the Games an accessible shuttle service for spectators will run between Pancras Road and the venue. The pink blobs appear to be highly inconsistent, however. Southfields and Earl's Court are step-free, but blobless, likewise West Ham which has step-free access all the way to the Olympic Park, but no pink circle. Perhaps some vandal has peeled them off. I'm not sure why the pink signs are up five weeks early. Nobody needs directions to the Royal Artillery Barracks or the Lee Valley White Water Centre until the end of July, but instead the signs are already there in June. Better early than late, obviously, to allow for any gaps or inconsistencies to be ironed out. But these signs are so early they'll be up for longer than they'll be used, which does seem either over-earnest or over-cautious. Still, if nothing else it gives us a chance to applaud TfL for their thoroughness, which will be enormously helpful to Games spectators unfamiliar with London. But also to hold TfL to account for their deviousness, because some of these signs deliberately fail to point along the most direct route. Say you're at Mile End, for example, hoping to get to the Olympic Park. 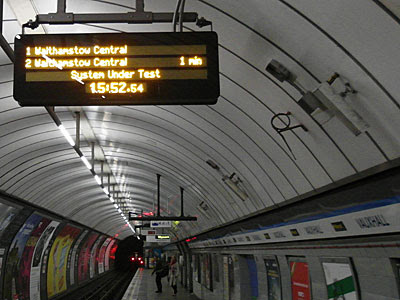 You could take the Central line to Stratford, one stop, and arrive in minutes right next to the main entrance. But the signs stuck to the pillars on the eastbound platform point instead towards the District and Hammersmith & City line. TfL want gullible travellers to ride three stops to West Ham, then get out and walk for an estimated 25 minutes up the Greenway. They're really worried that the Central line will be extremely busy during the Games, and are performing all kinds of misdirections to encourage ignorant spectators to travel an alternative way. It's the same at Liverpool Street. If you're on the eastbound Central line, three stops from Stratford, the pink signs on the wall don't point their way onto the train. Instead they encourage you to leave the platform and rise to the surface to travel a different, longer way. If the congestion's as bad as some fear and Central line trains are rammed, then any alternative route will be a lifesaver. Indeed it may turn out that Westfield gets so clogged you'll be glad you went to West Ham instead. 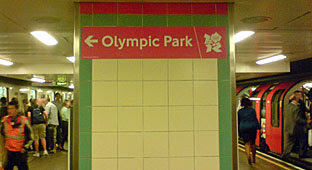 But be aware that the pink Olympic signs aren't always optimised with your best interests at heart. You've got five weeks to try them out. I am the custodian of the Stapler Graveyard. Everybody at work has a stapler. It's one of those essential bits of kit they grabbed from the stationery cupboard, probably in their first week, along with a pencil sharpener, a rubber and a pair of scissors. Or it might be a replacement stapler, sourced after some unseen worker wandered by and 'borrowed' the original, never to bring it back. Even in a supposedly paper-free office we all have a stapler, because sometimes there is paper, and sometimes a paper clip or clear plastic wallet just won't do. It may not get used very often, indeed increasingly less so as work goes digital, but the stapler is still a staple of office life. I'm the one at work who does the tidying up. Everyone else bungs stuff in cupboards and piles paper in corners, but I'm the one who goes back and files things away. I have shelves where I can still pinpoint projects from eight years ago, and a pretty good understanding of where everybody else's projects from eight years ago are too. I'm the one who rejigs the contents of cupboards into coherent themes, and packs boxes off to archive before the accumulation of paper gets too much. And when the threat of an office move is in the air, I'm the one who systematically fills the crates so that everything has its correct place in the new location. You're not surprised, I'll bet. I've been tidying up the cupboards recently in anticipation of yet another office move. The team may be moving to a different corner of the building, sometime yet to be confirmed, probably at a moment's notice. It's bound to be somewhere smaller with less storage space, because it always is, so I'm taking the opportunity to rationalise what we've got and downsize a little. This means delving into the darker corners of cupboards that don't normally get a good seeing to, and poking into long forgotten boxes full of hastily-stashed belongings. And that's where I found the staplers. Our team used to be bigger, several dozen, and collectively we owned a lot of staplers. Then came the redeployments, and the redundancies, and the occasional mysterious overnight disappearance, and now there's only a handful of us left. A few former colleagues discarded their assorted stationery before moving on, some may even have taken it home, but the majority left theirs behind on desks and in the backs of drawers. There are more important things to think about when life moves you on, and generic stationery detritus rarely gets a second thought. And that's one of the things I've been sorting through this week - a mini-mountain of part-sharpened pencils, assorted paper clips and leftover post-its. Some of it's clearly worthless, like the redundant biros and fluorescent highlighters whose ink has long run dry. But there are other items I'm loathed to throw away, for example a pile of perfectly good rulers, and three squished rolls of sticky tape, and some never-scribbled-in notepads. What to do with them? Our team's no longer big enough to have need of so much raw material. None of the teams sitting nearby are interested, because they all have drawers full of their own bits and pieces. And although there's a communal stationery cupboard down the corridor, that's officially for new stuff only, so recycled second-hand goods shouldn't be sneaked inside. Which makes me the custodian of the Stapler Graveyard. I've found two dozen all told, here and there, and reassembled them on a single shelf in a single cupboard. Most are black, a couple are silver, and only one is long enough to puncture the centre of an A4 piece of paper. They're of all shapes and sizes, dependent on which stationery own-brand was supplying the company at the time of acquisition. And they come with a selection of assorted staples, in small cardboard boxes, deliberately sized to fit certain mechanisms but not others. Alongside I've put the staple removers, those small snappy metal contraptions you can never find when you need them. And I've shoved the four hole punches down the far end, because nobody uses ring binders any more, so hole punches are almost an extinct species. Unconsciously I've laid out the team's discarded staplers like a mausoleum, packed close together in rows and files. Each chunky black headstone represents a former colleague - some even have sellotaped names to act as an unintentional epitaph. Every individual owner has passed on, many to a better place, some to employment purgatory, but others regrettably to somewhere more hellish. I used to work with these people every day, now most are nothing but a distant memory, dearly departed. But each lingers on, in some small way, in the collective apparition of their discarded stationery. I've deliberately left a narrow empty space up the side of the shelf where one day I'll add my own office stapler to the collection. And here it'll remain, alongside those from all my colleagues, until someone new comes along and clears our unwitting memorial clean away. At times of uncertainty, and diminishing national importance, we're none of us safe from change. The Stapler Graveyard will eventually claim us all. This is the 5000th post on diamond geezer. Hold on, it's going to be a long one. As I predicted, East London's cablecar is indeed due to open later this month. Arabfly Dangleway to open to passengers from end of June. Passengers will be able to take the first flight from midday Thursday 28 June 2012. Having refused to say anything about the opening date other than "summer 2012", for fear of looking stupid if things went badly, TfL will now have the new project open in time for the Olympics. That's convenient, and a bit of a relief, given that the Games should provide one of the few opportunities for genuine passenger demand. The Mayor of London will fulfill his pledge to build the UK's first urban cable car when the Arabfly Dangleway opens to the public from midday on Thursday 28 June 2012, providing a vital new river crossing for east London. Boris has pushed through his vanity project in a little over a year, aided by insufficient sponsorship money and a stash of taxpayers' cash. Although East London certainly needs more river crossings, it's hard to argue that a solution for pedestrians and cyclists only is the most efficient way to hike people across the Thames. As I've mentioned several times before, the cablecar goes from nowhere quite useful to nowhere quite useful, along a route few normal commuters would ever need to use. Instead it's far more likely to be frequented by tourists, come to see the "delights" of East London, if the sponsored tube map can tempt them out. The 1.1km long river crossing, between Greenwich and the Royal Docks, will have the capacity to carry up to 2,500 people per hour in each direction, the equivalent of 30 buses. What TfL fail to mention is that the Dangleway's theoretical maximum hourly capacity is also the equivalent of only three full Jubilee line trains. But I'm having trouble with their figure of 2500. 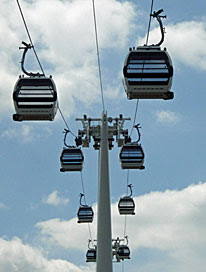 Each gondola carries a maximum of ten passengers, according to the FAQ. This suggests 250 crossings an hour, or just over four cars a minute. But according to the timetable "cabins arrive every 30 seconds", which is only half the necessary throughflow. 2500 people per hour in total perhaps, but not each way. Initially it will operate seven days a week, from 07:00 to 21:00 Mondays to Fridays, 08:00 to 21:00 on Saturdays and 09:00 to 21:00 on Sundays. For comparison, the tube and DLR run from approximately 05:30 to well after midnight six days a week, with start and finish curtailed by an hour on Sundays. The Dangleway isn't going to be useful for early risers or those attempting to get home late... apart from during special events when operating times may be extended up to 00:00. What TfL haven't yet broadcast widely is that 9pm is the cablecar's closing time only between April and September. There'll be an 8pm shutdown during the dark half of the year, so any commuters had better get home quick. Transport for London confirmed today that passengers will be able to touch in at the gates with their Oyster pay as you go cards to take a flight on the Arabfly Dangleway; and that they have developed a 'frequent flyer' boarding pass for regular users, which will allow them to make 10 single journeys for £16, equating to just £1.60 per single journey. The frequent flyer boarding pass will appeal to people living or working in the local area who wish to use the Arabfly Dangleway on a regular basis and will be available to purchase from both Arabfly Dangleway terminals. Sounds reasonable, so far, doesn't it? You can use your Oyster card, and the cost of travel is just £1.60 a ride. But that's not quite what it says. £1.60 is the price only for mythical commuters who need to travel regularly between North Greenwich and the Royal Docks, or for anyone who thinks they might use the cablecar ten times in a 12 month period. A single fare boarding pass using Oyster pay as you go for the Arabfly Dangleway will cost £3.20 (child fare £1.60). £3.20 is at the upper end of the price range that anyone might have predicted, and seems a bit steep. For comparison, the price to make the same journey using the Jubilee line and DLR (via Canning Town) is less than half that - a maximum of £1.50. You won't be riding the cablecar because it's cheaper, not even with a 'frequent flyer' pass. This £3.20 single is the only fare you can pay by flashing your Oyster card at the barrier. For all other fares a boarding pass is required, the purchase of which will add extra time to your journey. At most tube stations across town TfL is busy trying to make the ticket office redundant, whereas here it's an integral part of the design. Passengers with a Travelcard or other Oyster cards (including Freedom Passes) will be able to fly for the same fare but will need to buy a boarding pass from ticket offices or vending machines which are available at both terminals, Arabfly Greenwich Peninsula and Arabfly Royal Docks. I pay well over £1000 a year for my zones 1-3 Travelcard, which I might have hoped would include the cablecar. Not so. Despite flying firmly through Zone 3, I'm going to have to fork out £3.20 every time I ride this way, compared to zero additional surcharge for taking the tube. Folk with Freedom Passes get to pay too, rather than travelling for nothing, presumably to stop the gondolas being filled with circulating pensioners during the day. For comparison, riverboat services have a similar arrangement whereby Travelcards can be used to pay a non-trivial amount at a reduced rate. Even so, a boat trip across the river from North Greenwich costs only £2.40, so the cablecar's still considerably more expensive. The high fare is a strong hint that the Dangleway isn't genuinely part of London's public transport network, it's a tourist-facing add-on which needs to make its money from one-off passengers. Passengers without an Oyster or Travelcard will need to pay a slightly higher cash fare. Turn up without Oyster, and you'll pay £4.30. That's 86p a minute, which is more expensive than a spin round the London Eye, or the equivalent of spending only half an hour at Madame Tussauds. It turns out Travelcard users are only getting a 25% discount on this full fare, which is less than the one-third discount we enjoy on riverboat services. For those who want the experience of an extended journey to enjoy the fantastic views of the City, which include Canary Wharf, the Thames Barrier and the Olympic Park, there will be the option to take a non-stop return journey. This '360 degree tour' will cost £6.40 with Oyster. I find it slightly misleading to describe a straight line there and back as a '360 degree tour'. In truth, all you're getting is twice as long to stare out beyond East London's industrial hinterland, hardly the most desirable view the capital has to offer. And that's no special return fare, it's merely the single fare doubled. This 'extended' ticket is almost an admission that there's nothing much to see on the other side, so you might as well just turn round and come straight back again. Oyster Pay as you go users can also receive a multi journey discount, equivalent to £1.60 per single journey. To receive the discount, passengers have to travel for 5 or more journeys in a week (Sunday to Saturday) by swiping their cards at the barrier. They will initially be charged the normal Oyster discounted fare of £3.20 (adults) and a refund of 50% will be available in the following week by swiping their cards on the Dangleway ticket barriers as they make their first journey in the following week. The refund will remain available for 6 weeks (to cover holidays or other absences). In case you hoped you might earn a multi journey discount by riding back and forth several times, no you won't. The automatic Oyster discount is aimed at regular travellers only, should they exist, because you'll only earn the discount by coming back next week. Even then you'll have to pay another full price £3.20 at the gate, which is then refundable the following week, and so the charade begins again. What’s the difference between the boarding passes? The Arabfly Dangleway is not part of the general London travelcard system. Passengers wishing to use the Arabfly Dangleway must purchase a boarding pass or use Oyster Pay as you go. There are three boarding pass types on the Arabfly Dangleway. • Single boarding pass allow a single trip on the Arabfly Dangleway. • Return boarding pass allow the passenger to make a return journey on the Arabfly Dangleway on the day of purchase. 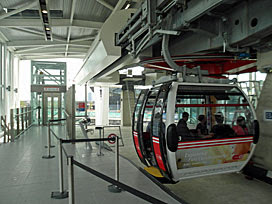 • '360' boarding pass or private hire allow the passenger one continuous trip on the Arabfly Dangleway travelling from one terminal to the other and back. A 25% discount is available on single and return journeys if the passenger is using Oyster Pay As You Go or has a valid travelcard or freedom pass. Multi trip boarding passes are available for regular users at discounted prices. These can be purchased at the ticket office, or for Oyster users this will be calculated automatically. Before 10:00 and after 15:00 - approximately five minutes. Between 10:00 and 15:00 - approximately 10 minutes. You read that right. The Dangleway is a two-speed transport service, because in the middle of the day the gondolas will slow down to make their journey in ten minutes rather than five. This is a blatant admission that the prime function of the cablecar between peak hours is to act as a tourist attraction. If you've got an urgent lunchtime appointment on the other side of the river, don't waste your time on the Dangleway, take the tube. TfL's timetable notes that "during busy periods, the extended journey time may not be available." But I wonder if an unintended consequence of this slowdown will be to suffocate tourist numbers at other times. If you're only here for the view, why the hell would you bother turning up at 09:30, or 19:30, or even 16:01? Are pregnant women allowed on the Arabfly Dangleway? Pregnant women are welcome to travel on the Dangleway. Just like travelling in a plane however, this would be at their own discretion. The cabins themselves are designed to move whilst travelling between the two terminals which is entirely safe but may cause discomfort to passengers who suffer from nausea. If you are pregnant and are unsure whether it is a good idea to travel on the Dangleway, please consult your doctor first. I'm glad we've cleared that one up. If there are adverse weather conditions, how do I know if the Arabfly Dangleway is operational? Check www.tfl.gov.uk/arabflydangleway for more detailed information. At stations on the underground, DLR and Overground networks Service update screens (Rainbow boards) will also keep you informed as to the status of the Arabfly Dangleway. I'm afraid so. While Rainbow boards currently keep London updated regarding delays to tube, DLR and Overground, from next week the cablecar will nudge in with a row of its own. You may not care that there are overhead wire problems in Silvertown, nor that the service has closed down for the evening, but the latest updates on Dangleway status will blare out from the list all the same. It's amazing how much influence £36m of sponsorship money gets you, how many different places there are for your branding to intrude. Croydon's Tramlink doesn't get such favouritism, nor riverboat services on the Thames. But, like an aerial Waterloo & City line, this two-stop link fights well above its weight. Passengers are advised to use public transport to get to the Arabfly Dangleway. 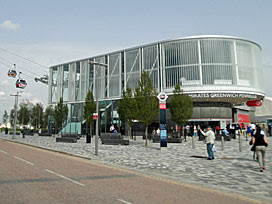 Buses and tubes are available a short walk away at North Greenwich Underground station at the South terminal, or at Royal Victoria station on the DLR at the North terminal. Let's check out those "short walk"s using TfL's Journey Planner. 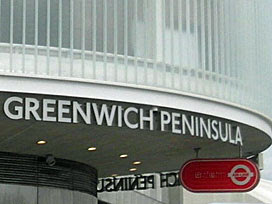 In particular, there are no good bus connections to either of the Dangleway terminals. On the north side, the walk from the "nearest" bus stop involves hiking up and over the DLR station, which is unexpectedly inconvenient. And on the south side, seven different bus routes run directly past the terminal but none of them stop. Until someone at TfL thinks to plonk a bus stop here (assuming it's even possible), the five minute walk from the bus station remains. And that's not all. 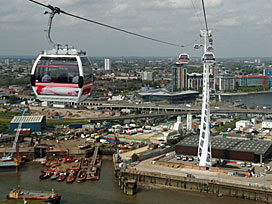 The Arabfly Dangleway boasts its own dedicated website, at www.arabflydangleway.co.uk, which is run by the airline rather than TfL. It's where I found the list of FAQs I referred to earlier ("Are there toilets? No there are not toilets at the Arabfly Dangleway"). The front page is fairly empty but has a countdown to the "inaugural flight", presently 9 days, a few hours and counting. The main advertising concept is that from Thursday week the airline is introducing Two New Destinations - namely "the north and south sides of the Thames". And the list of places the marketing people think the cablecar will help you visit is incredible. None of these are within four miles of the cablecar, and most are considerably further away than that. Indeed whoever put these two lists together has summarily ignored East London, where the Dangleway is, preferring to concentrate on the "nicer" parts of the capital out west. This website appears to be part of a foreign-facing campaign to attract visitors to London, in this case by dangling in front of them a selection of tourist attractions with no basis in local reality. Much like the cablecar itself, to be honest. Let's leave the final word to Tim Clark, the President of Arabfly Airways. A finer stream of self-important PR codswallop it's hard to imagine. But that's the Dangleway for you. It's been spun as "transforming the surrounding area into a vibrant new metropolitan quarter", whereas in reality it's just an aerial sideshow to lure tourists somewhere new. The engineering's an impressive achievement, to be sure, and you'll probably come once for a ride and help make it an overnight success. But Boris's unholy alliance of public money and corporate branding is more about making a statement than fulfilling a need, and hangs uncomfortably across East London's skyline.